The answer to the question in this context is “chicken” or – at least a particular chicken protein. There is however a further twist in that this particular chicken protein turns out to come both first and last. 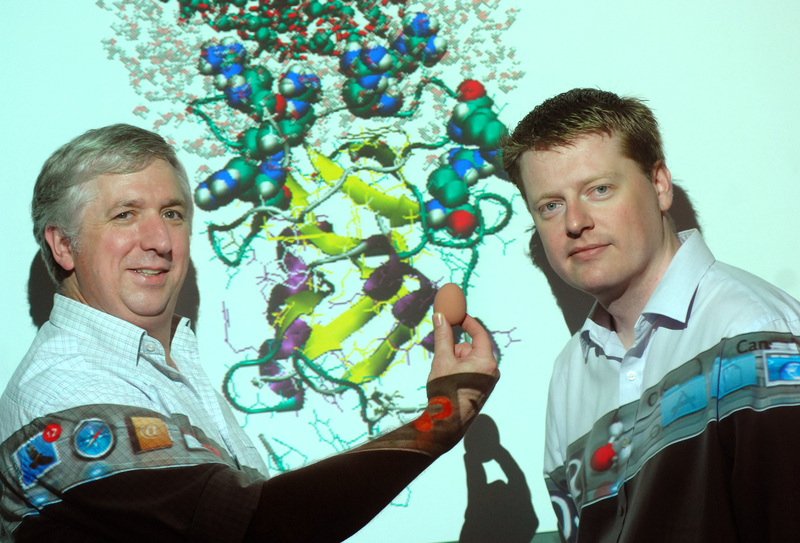 That neat trick it performs provides new insights into control of crystal growth which is key to egg shell production. 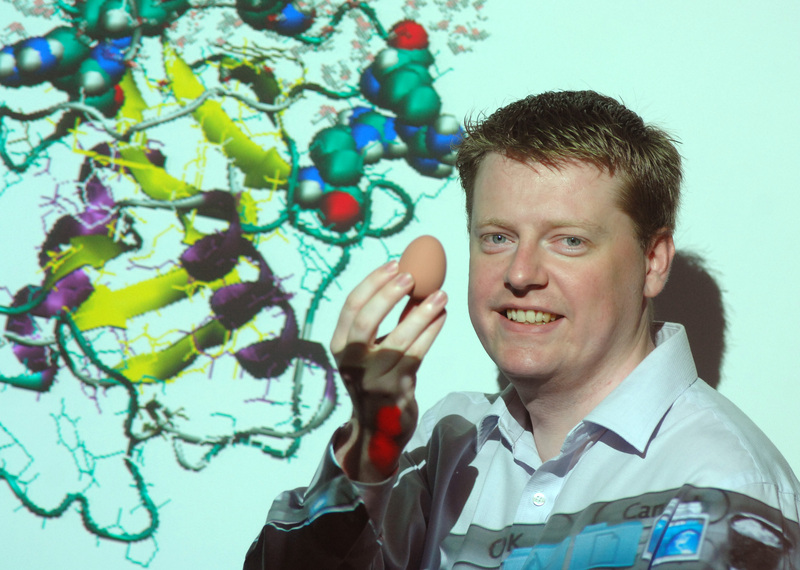 Researchers had long known that a chicken eggshell protein called ovocleidin-17 (OC-17) must play some role in egg shell formation. The protein is found only in the mineral region of the egg (the hard part of the shell) and lab bench results showed that it appeared to influence the transformation of (CaCo3) into calcite crystals. The mechanism of this control remained unclear. How this process could be used to form an actual eggshell remained unclear. University of Warwick researchers Mark Rodger and David Quigley, in collaboration with colleagues at the University of Sheffield, have now been able to apply a powerful computing tool called metadynamics and the UK national supercomputer in Edinburgh to crack this egg problem. 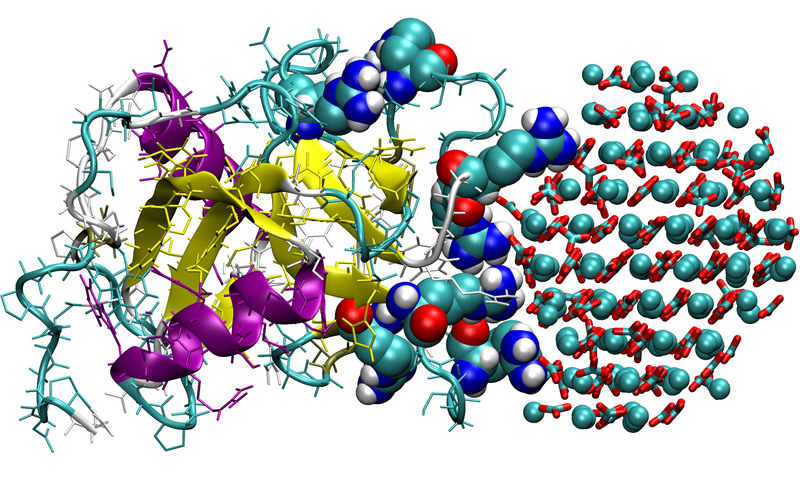 Using these tools The Warwick and Sheffield researchers were able to create simulations that showed exactly how the protein bound to amorphous calcium carbonate surface using two clusters of “arginine residues”, located on two loops of the protein and creating a literal chemical “clamp” to nano sized particles of calcium carbonate. While clamped in this way, the OC-17 encourages the nanoparticles of calcium carbonate to transform into “calcite crystallites” that form the tiny of nucleus of crystals that can continue to grow on their own. But they also noticed that sometimes this chemical clamp didn’t work. The OC-17 just seemed to detatch from the nanoparticle or “be desorbed”. The researchers h ad therefore uncovered an incredibly elegant process allowing highly efficient recycling of the OC-17 protein. Effectively it acts as a catalyst, clamping on to calcium carbonate particles to kickstart crystal formation and then dropping off when the crystal nucleus is sufficiently large to grow under its own steam. This frees up the OC-17 to promote more yet more crystallisation, facilitating the speedy, literally overnight creation of an egg shell. The researchers believe that this new insight into the elegant and highly efficient methods of promoting and controlling crystallisation in nature will be of great benefit to anyone exploring how to promote and control artificial forms of crystallisation. "Does this really prove the chicken came before the egg? Well this actually further underlines that it's a fun but pointless question. This science does however give new insight into an efficient and fast method of crystallisation. It will help in research to devise better synthetic bone and research into how to store/sequester CO2 as limestone."